“GPs should prescribe protein powders and weight lifting to pensioners to help reverse frailty,” The Daily Telegraph reports. Frailty among older adults is a growing problem. It can affect peoples’ ability to carry out everyday activities, have a negative impact on quality of life and increase the risk of other health problems. Under UK government recommendations GPs are required to have systems in place to help identify people living with frailty. But how to provide effective care and support once people are identified is another issue. The study was conducted by researchers from St Vincent’s University Hospital and Trinity College Dublin. One of the researchers received funding from the Irish Health Research Board for the Systematic Approach for Improving Care for Frail Older People (SAFE). It was published in the peer-reviewed British Journal of General Practice. The Telegraph and Mail Online’s coverage was accurate, with the exception that both sources suggested GPs should prescribe protein “powders”, which is not strictly correct. The review did find that increased protein intake was effective. But the study’s authors did not make any recommendation about how to increase protein intake, and didn’t mention powders at all. Frailty is described in the review as “a state of physiological vulnerability with diminished capacity to manage external stressors” and is linked with increased risk of illness, falls, dependency, disability and death. Studies estimate frailty affects around half of people above the age of 80. The study searched medical literature databases for relevant studies using a variety of terms such as “frailty”, “primary care”, “community”, “screening” and “interventions”. The researchers assessed and compared the studies, according to their design and methods, interventions and the outcomes measured. They used a scoring system to rate the intervention’s effectiveness in terms of whether it improved frailty according to given criteria. They also considered how easy the intervention would be to implement in terms of time and money, and healthcare professionals’ involvement (for example, could a single professional provide an intervention or would it take a team of professionals). However this review can’t provide specific recommendations, such as the best type of strength training or the exact amount of protein needed and whether this should come just from dietary sources (such as meat, fish and cheese) or in the form of supplements. 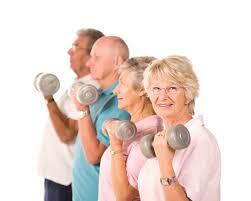 Previous ArticleCan aerobic exercise slow down ageing?